Yum. Talk about delicious. Two of our favorite things in our house come together to make such a delicious breakfast. Cinnamon Rolls and Homemade Applesauce. It makes me hungry just looking at the picture. I must stress though, the HOMEMADE applesauce, as I really don’t feel that jarred applesauce is adequate for this yummy breakfast. This takes a bit of preparation. The day before we were going to have this breakfast, I started cutting apples for homemade apples sauce. This is so delicious and easy to make. I love that you can control exactly how much sugar is it it, too! You can start this in your crock pot before you go to bed, put it on low and it will be warm and ready for breakfast. Put crock pot on low and cook for 8 hours. Don’t worry about cooling this down at all because it tastes the best warm on your cinnamon roll waffle! This is the easy part. 🙂 The only ingredient is pre-packaged cinnamon rolls. Although, I am curious to try using homemade cinnamon rolls to see how it turns out. Place your cinnamon rolls on a pre-heated waffle maker. I started with three (kind of looks like a hidden mickey) but then realized that I could fit four on there. It only takes a couple of minutes to cook. 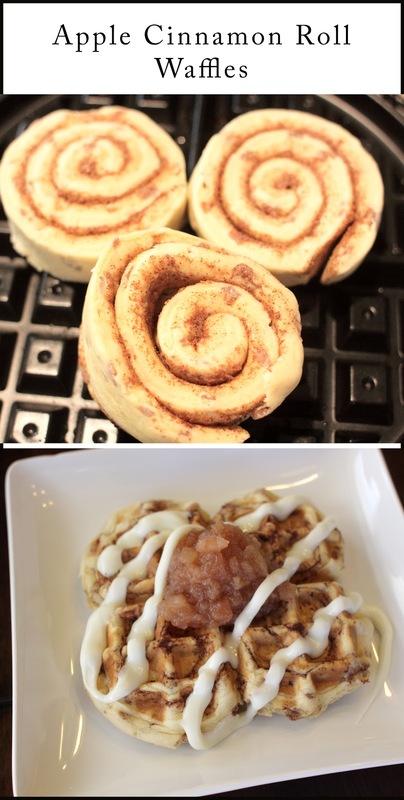 Remove from waffle maker, add a scoop of your delicious homemade apple sauce and drizzle with frosting that was included with your cinnamon rolls. Voila! You are done and have a VERY tasty breakfast!